First unveiled in the Viva Technology Tradeshow, the Air France-KLM Group created an immersive virtual reality experience dubbed “Business immediate boarding”. The goal of the experience is to provide travel agencies with additional tools to showcase the airline’s international business class offerings. Visitors interested in the product will be taking through a seamless travel journey from checking into a flight, relaxing at the Air France lounge and travelling on board the flight. Real time 3D, photogrammetry techniques and actual props are used to recreate the realistic immersive experience. The airline expect the entire set including virtual reality headsets will be available worldwide from November 2017 onwards. Air France is also trialling the virtual reality headsets on board for business class passengers on roundtrip flights from Paris’ Charles de Gaulle International Airport (CDG) to Princess Juliana International Airport (SXM) in St. Maarten. On these flights starting in August 2017, there will be four virtual reality headsets are available offering forty+ 2D, 3D and 180-degree films, tv series and documentaries. 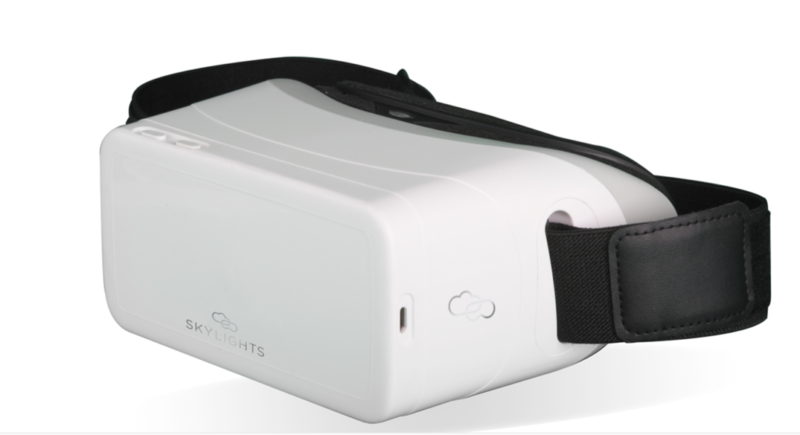 The airline is partnering with San Francisco startup SkyLights to create “a valuable learning experience for the company and confirms the importance of improving the customer experience with original and innovative solutions”. The startup is working with Golden Eagle Entertainment and key content players such as 20th Century Fox, Dreamworks, National Geographic, Lionsgate, BBC and Baobab to gain access to early window blockbusters and unique contents. Weighing only 280g, the headsets are light, take up less space than normal inflight entertainment in-seat or seat-back entertainment systems and can be individually controlled. If the trial is successful, Air France will expand the trial to other flights in 2018. Air France is introducing virtual reality for its business class passengers in the ticketing process and as part of on board services. The former is a new idea which has not been used in the industry while the latter has been successfully implemented by other airlines. If the trials are successful, expect to see Air France expand virtual reality to other cabins or subsidiaries such as KLM and Joon (Related News). ⟵How Long Can Commercial Aircrafts Fly Non-Stop Today?